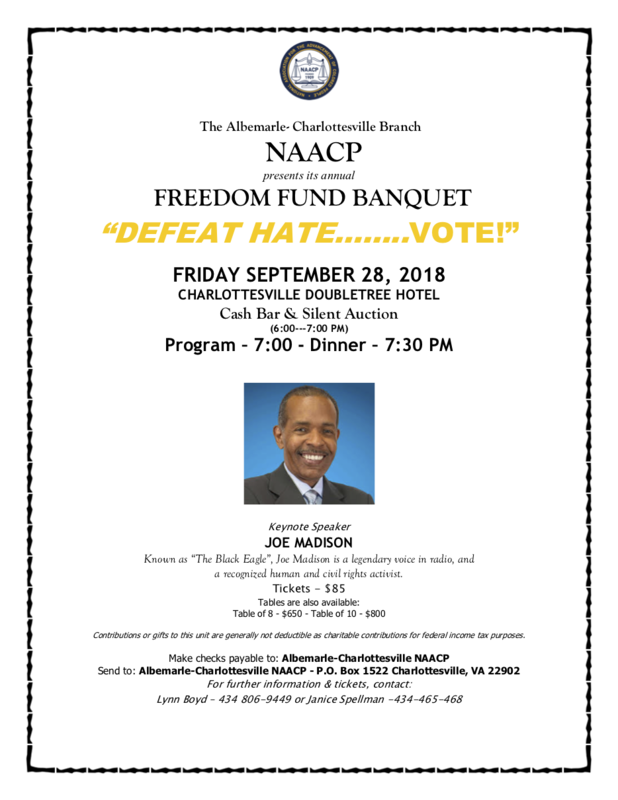 In addition to its regular monthly meetings, the NAACP Albemarle-Charlottesville Branch has premier events throughout the year as well as participating in other important community events. Click here for information on events. Everyone is welcome to the presentation at the beginning of the meeting. The Business meeting begins after the presentation and one must be an active NAACP member to attend. a recognized human and civil rights activist. Contributions or gifts to this unit are generally not deductible as charitable contributions for federal income tax purposes. The Freedom Fund Banquet is the major fund raising event for all branches of the NAACP. Your contributions and donations allow us to offer valuable workshops, scholarships and activities for our youth and adult membership as well as for the larger community that we serve. Your contributions and donations also make it possible for our branch to have representation at state, regional, and national conferences where members receive important information and training that promote civil rights and justice for all!